In the run up to the inaugural Hong Kong Fintech Week (held at PMQ on 7-11 Nov), we thought it would be fitting to invite the new Head of Fintech for InvestHK, Charles D'Haussy, to share the latest trends in financial innovation and tell us how he will help HK become a leading global fintech hub. Charles has worked for 8 Securities, one of the more successful online brokerages, so is sure to understand the current challenges faced by fintech startups in Hong Kong. On top of discussing what InvestHK is doing to attract foreign fintech firms to Hong Kong, we will cover Hong Kong's future in emerging technologies such as: digital identities, mobile payment, blockchain, artificial intelligence, robotrading, peer-2-peer lending, crowdfunding and big data analytics. Learning from the StartMeUp campaign, InvestHK has engaged various industry players to contribute content including: the Hong Kong Monetary Authority (HKMA), the Securities and Finance Commission (SFC), Finovate, the Hong Kong Fintech Community, Cyberport, NexChang and Finnovasia. Sign up for our 105th social mixer, held at Orange Peel on 2nd Nov (6:30pm - 9pm), via our Facebook Group (4,845 members) or MeetUp group (791 members). 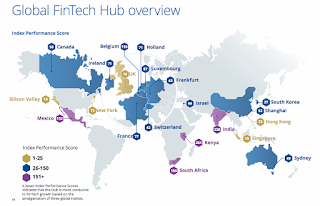 A recent report, "Connecting Global FinTech: Hub Review 2016", published by Deloitte in collaboration with All Street Research, places Hong Kong alongside London, New York, Singapore and Silicon Valley. But, we still have some catching up to do with our friends in Singapore, who's government has assigned S$225m to support it's budding fintech industry. [An extract follows below. Download the full report from the Global Fintech Hubs Federation website].